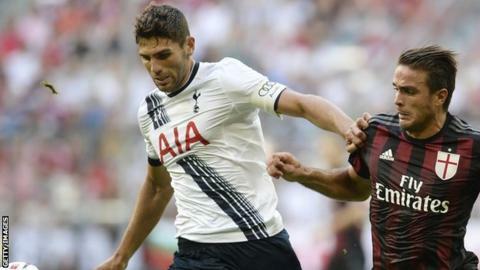 West Brom's bid to sign Federico Fazio from Tottenham has stalled. The 28-year-old defender had a medical with the Baggies on Friday but no agreement has been reached over his personal terms. There is a chance the deal could be resurrected as a loan move but manager Tony Pulis is looking at other options. Meanwhile, Pulis says he might have to offer Spurs target Saido Berahino, 22, some protection from the ongoing transfer speculation. The Baggies turned down a bid for Berahino from Tottenham on Tuesday. "I told him not to get wrapped up in all the hype," said Pulis. "He's a young lad and he might need some protection." Berahino is yet to score this season after managing 20 goals last term. And Pulis accepts West Brom would not be able to hold off Tottenham forever should the offers continue to rise. "I'm sure Tottenham wanted to keep Gareth Bale and Manchester United wanted to keep Cristiano Ronaldo," said Pulis. He is expected to face Chelsea at The Hawthorns on Sunday. "God has given him a great gift and he can't waste it. Lots of people have done that in the past. I just hope he's not one of them."